And it’s that time of year yet again . . .
. . . when the litter mounts up, you can’t park along by the dunes, unknown dogs run amok – chasing young Nicholas hither and yon (not to worry, he’s more than up to it), the holidays are upon us and the village is full of folk, wandering about wondering what to spend their money on in George Mackay’s. It is also about now when, having got them through all the sturm und drang the elements could throw at their offspring, something seems to loosen in the herring gull resolve, and a baby comes a cropper. 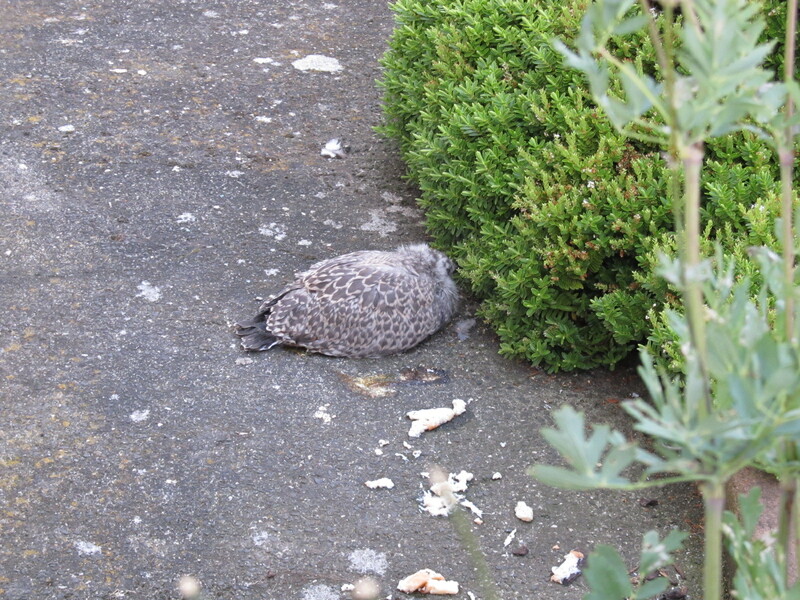 This evening we discovered that our favourite herring gull child had fallen in a first flap of freedom from the roof and landed awkwardly, apparently with some force on his little legs, on next door’s pathway; his unwillingness to shift indicates he will probably now suffer a slow, miserable demise. Although Nigel, our first seagull chick of several years ago, survived his fall from the roof, we have a sick feeling about the likelihood of Tiny getting over his brush with gravity. We have taken him some soaked bread but hope his attentive parents will come down and feed him mackerel, crab or chips, or something else more to his taste. The physical fragility of birds is legendary and it is all the more striking when compared with the indomitability of their spirit. Good luck little one, now moved to a safer, softer resting place beneath the plants: we’ll keep an eye on how you’re doing.